Dominican pitcher Joaquin Andujar, who died at the age of 62 on Tuesday, was a trail-blazing player and one of the game's brightest personalities during his time with the Astros, Cardinals and A's. The baseball world lost “One Tough Dominican” and one of its more colorful personalities on Tuesday, when Joaquin Andujar died at the age of 62 following a lengthy battle with diabetes. Hot-tempered, demonstrative on the mound and eminently quotable, the four-time All-Star and hero of the 1982 World Series blazed a trail from the Dominican Republic to the mound that the likes of Ramon and Pedro Martinez and Bartolo Colon would follow, leaving an indelible mark on the game during his 13-year major league tenure. For his career, which ran from 1976 to ’88 with the Astros, Cardinals and Athletics, Andujar went 127–118 with a 3.58 ERA (99 ERA+), 4.3 strikeouts per nine and 16.8 WAR. However, those numbers hardly capture his flair, his capacity for intimidation on the mound, his unpredictability or his humility when it came to his path from sugar cane country to big-league stardom. Born in the baseball hotbed of San Pedro de Macoris in 1952, the young Andjuar was originally more attracted to basketball than baseball, which he picked up at age 10, playing in the streets with a rag ball and a broomstick. Signed by the Reds in 1969, he struggled mightily with his control in the minor leagues, walking 6.7 per nine innings in six minor-league seasons (1970 to ’75) but somehow managing to hold his own at Double A and Triple A. Every winter, he returned home to pitch for Estrellas, a team managed by Hub Kittle, the pitching coach of the Astros and a pivotal force in Andujar’s career. Indeed, the rookie Andujar’s performance was uneven; though he threw 172 1/3 innings, he struck out just 3.1 per nine and walked 3.9, and his 3.60 ERA translated to just an 89 ERA+. That was pretty much how it went for the next four seasons as well, as he shuttled between the rotation and bullpen. He made the NL All-Star team, managed by Anderson, in 1977 on the strength of 10 first-half wins, making him just the second Dominican-born pitcher to do so after Hall of Famer Juan Marichal. A pulled hamstring kept him out of the contest, however, and he won just one game in the second half. Only in 1979, when he went 12–12 with a 3.43 ERA in 194 innings and earned another All-Star appearance, did he qualify for the ERA title or post an ERA+ above 100, and even then, he walked 88 while striking out just 77. While with Houston, Andujar gained notoriety for his antics and his unpredictability. He would pour jugs of milk over his head after a loss, got engaged in fisticuffs with teammate and best friend Cesar Cedeno, and once stepped out of the batter’s box during a spring training game when a butterfly distracted him. “No butterflies in Dome,” he said when asked how he’d handle such an occurrence during the regular season. He would even punctuate key strikeouts with an index-finger six-shooter “bang!” The Astros eventually grew tired of his act and traded him to the Cardinals for outfielder Tony Scott on June 7, 1981, less than a week before the start of the seven-week player strike. The move paid off. Andjuar’s performance improved after the strike ended, and in 1982, he emerged as the staff ace, going 15–10 with a 2.47 ERA (third in the league) over 265 2/3 innings en route to 5.8 WAR (fourth). Though underpowered, with just two players reaching double digits in homers, the Cardinals’ combination of pitching, speed and defense—the latter anchored by legendary fielding whiz Ozzie Smith at shortstop—helped them to their first playoff berth and pennant since 1968. Andujar, who posted a 0.92 ERA and threw two shutouts and a three-hit complete game in September, started and won the third game of the NLCS against the Braves, capping a sweep. He followed that with 6 1/3 shutout innings against the heavy-hitting Brewers in Game 3 of the World Series in Milwaukee, though he departed after a hot one-hopper off the bat of Ted Simmons bruised his right knee. He had to be carried from the field and taken for X-rays, and he showed up on crutches the next day. Still in pain when he took the mound five days later, Andjuar made his legend by living up to his self-billing as “One Tough Dominican,” throwing seven strong innings in Game 7 in St. Louis and exchanging words with Milwaukee’s Jim Gantner, whom he claimed swore at him and called him “a hot dog” after the pitcher glowered at him upon fielding another dangerous comebacker. Home plate umpire Lee Weyer, all 6'6" and 258 pounds, had to restrain the 6-foot, 170-pound Andujar from taking things further. The Cardinals prevailed, 6–3, winning their first championship since 1967, but the incident may have prevented Andjuar, who had a series ERA of 1.35, from claiming MVP honors; instead, catcher Darrell Porter, who hit .286/.310/.464 with five RBIs—none of which were team bests—won. Andujar struggled the following year, going 6–16 with a 4.16 ERA, but he was back on top in 1984, winning 20 games, including four shutouts, and throwing 261 1/3 innings, all NL highs. He made his third All-Star team, placed fourth in the NL Cy Young voting and even took home a Gold Glove. As with the All-Star appearances, the 20 wins made him the second Dominican pitcher after Marichal to reach such heights. If the stories are to be believed, he also joined the company of Babe Ruth by calling his shot, predicting a grand slam to rightfield against the Braves from the on-deck circle. ​Andujar more or less duplicated his pitching performance the following year, going 21–12 with a 3.40 ERA in 269 2/3 innings, with another All-Star appearance and a fourth-place finish in the Cy Young voting, but where the Cardinals finished third in the NL East at 84–78 in 1984, they won 101 games and the division in ’85, again using Herzog’s signature combination of speed and run prevention. Andujar wasn’t the only top-flight starter in the rotation, as John Tudor went 21–8 with a 1.93 ERA and a league-high 10 shutouts, and Danny Cox went 18–9 with a 2.88 ERA. Those two helped to pick up the slack as Andjuar stumbled to the finish line with a 5.67 ERA over his final 12 starts. Andujar was roughed up in his Game 2 start of the NLCS against the Dodgers, failing to make it out of the fifth inning in a loss that put the Cardinals in a 2–0 hole in the series, which was in its first year of the seven-game format. The Cardinals won the next three, however, and Andujar survived six rocky innings in a Game 6 clincher as his teammates overcame an early 4–1 deficit, giving them their second pennant in four seasons. Alas, he continued to hit bum notes in the World Series against the Royals, surrendering nine hits and four runs in a Game 3 loss. When Don Denkinger's infamous blown call at first base in the ninth inning of Game 6 allowed the Royals to tie the series at three games apiece, Herzog opted to start Tudor, who had held Kansas City to one run over 15 2/3 innings, including a five-hit shutout in Game 4, on three days rest rather than Andujar on four. Herzog's plan didn't work out, as Tudor was shelled for five runs in 2 1/3 innings. By the time Andujar came on in the fifth inning, the score was already 9–0. Andujar gave up an RBI single, then began arguing with Denkinger (who was working the plate) over balls and strikes, which led to Herzog’s ejection. When Denkinger called another ball, Andjuar charged the umpire, had to be restrained by multiple teammates and was ejected as well. In the clubhouse, he destroyed a toilet with a bat while the Royals counted down the outs to a title. 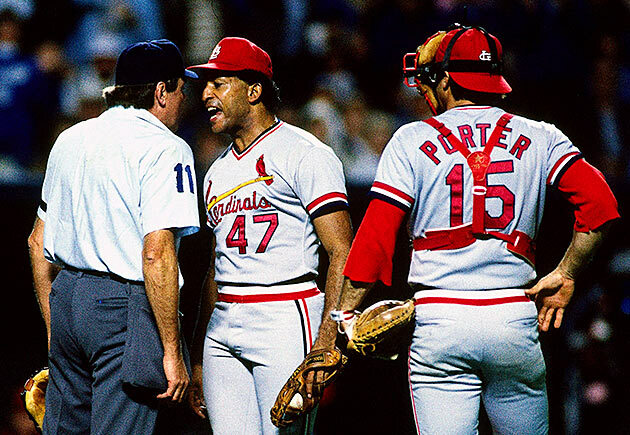 Andujar’s outburst earned him a 10-game suspension from commissioner Peter Ueberroth to start the 1986 season, but by then, the pitcher had even bigger problems. His name had surfaced during the so-called Pittsburgh Drug Trials the previous fall, as former Cardinal Lonnie Smith testified at the trial of dealer Curtis Strong that he had used cocaine with teammates Keith Hernandez and Andujar in 1982. Smith, Hernandez and Andujar were among the seven players issued year-long suspensions that were commuted in exchange for paying 10% of their 1986 salaries (Andujar’s was $1.23 million) to drug-abuse programs, providing 100 hours of community service in each of the next two years and submitting to drug testing for the remainder of their careers. The Cardinals cut bait on Andujar that winter, trading him to the A’s (whose general manager was Sandy Alderson) in exchange for pitcher Tim Conroy and catcher Mike Heath. His season-opening suspension was reduced to five games on appeal, and while he struggled in his first start—with Denkinger behind the plate, no less—and battled injuries, he went 12–7 with a 3.82 ERA in 155 1/3 innings for a team that won only 76 games, but featured Rookie of the Year Jose Canseco, late-season call-up Mark McGwire and, as of mid-July, manager Tony La Russa. Alas, Andujar didn’t stick around Oakland long enough to be part of the green-and-gold’s renaissance, as injuries limited him to 13 starts and a 6.08 ERA in 1987. He returned to Houston as a swingman in '88, making 10 starts and 13 relief appearances. After a sparkling performance in the short-lived Senior Professional Baseball League in '89, he signed with the Expos (with GM Dave Dombrowski) in December of that year, but was cut at the end of spring training the following April. Andujar started a trucking business in the Dominican Republic late in his career. He spent most of his retirement in his native country, though he continued to keep tabs on the Cardinals and returned to St. Louis in 2007 to help celebrate the team’s world championship from the previous fall. “It's someone that served, to people like me, as a role model … This is a big hit for the Dominican Republic, because before I thought about baseball as a career, it was only a dream. And Andujar was in the middle of every dream I had because he was one of the best pitchers we ever had in the Dominican Republic. Andujar will be honored on Tuesday in San Pedro de Macoris and will be buried Wednesday.